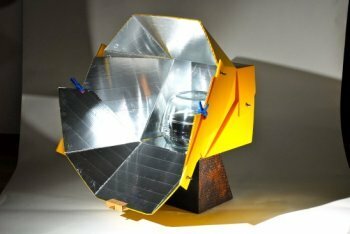 The All Season Solar Cooker is definitely unique, and in our opinion is one of the most versatile solar cooker designs available on the market. 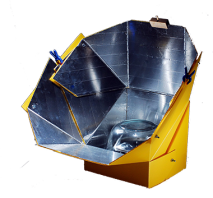 If you want a solar cooker that can adapt to the variable nature of a solar cooking day then you will definitely find the All Season Solar Cooker will fit the bill. With the ASSC you can take advantage of longer cooking periods based on the fact that you have a cooker with exactly that purpose built into the design of this particular solar cooker. First Position range of adjustment. These pictures (below)show the full range of adjustment for the First Position. The ASSC boasts a COORDINATED ARTICULATING reflector array (unique among solar cookers) The array is composed of an upper reflector group, a lower reflector group, and side reflector panels. The upper and lower group are connected using an "elevation bar" which holds the two groups at a specific angle to each other. . When one group is moved, the other group moves equally as the elevation bar brings it along. When one group is placed in solar focus, the other group is also in solar focus. There is never any guess work, all panels move together in a coordinated fashion that ensures that when one reflector group is focused, they all are focused. In this "first position" the ASSC can focus on a solar elevation of 0º - when the sun is first rising, all the way up to 50º. I use the "first position" every morning throughout the year and all day every day in the winter months. This image shows the full range of adjustment for the second position. This is the same range of adjustment as was shown in first position, however the ASSC has been flipped 90º onto its alternate cooking floor. In the "second position", the ASSC can focus on a solar elevation of 40º to 90º. This is the position that I use when the solar elevation is above 40º. I use this position mid day in spring, summer and fall but never in the winter because the sun does not get above 40º elevation in the winter months. The photo below shows all the different modes of the All Season Solar Cooker. From left to right we see the All Season Solar Cooker in the early morning position, the mid morning position, the winter noon position. The cooker is then flipped onto its summer floor (note the short front wall is now visible) to produce the summer mid morning position, the summer noon position and the summer noon at the equator - with the sun directly overhead position. 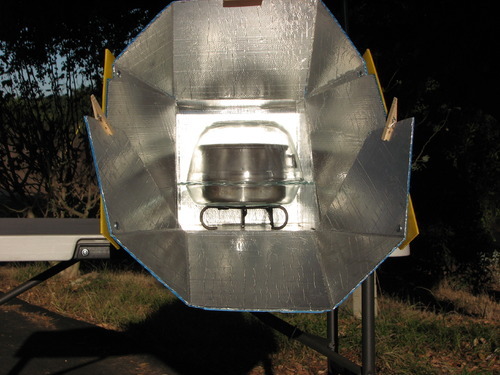 The All Season Solar Cooker can be adjusted for any solar elevation. And because the reflector arrays are attached to each other and coordinated, when one panel becomes focused, they all become focused. Study these photos. You will see how the cooker has the unique ability to effectively capture the sun the entire time that it is visible. If the sun is up for 8 hours, you can cook for 8 hours. If the sun is up 12 hours, you can cook for 12 hours. 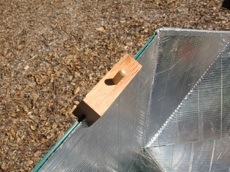 This is the most important feature of the All Season Solar Cooker. Starting early and cooking all day long, the All Season Solar Cooker produces a much greater amount of product. And is as easy to use as the simplest panel cookers. Weighing in at just over 2 pounds, and folding to a mere 1.5 inches in thickness, the ASSC is easily transported and easily stored. Ultra rugged 4mm corrugated polypropylene - completely water proof, extremely durable. Pure aluminum - 0.2mm foil (super heavy) is laminated to the polypropylene. Ultra lightweight yet thick enough to withstand rugged use and, if needed, polishing. The Sunsight is also used to set up to a 3 hour cooking session. The cooker is turned and the array is adjusted upward (mornings) or downward (afternoons) and always ahead of the sun to achieve a shadow as seen above. The ASSC is now focused up to 18º ahead of the sun. As time passes, the shadow will shrink into the pin, then re-emerge on the other side or the pin. When the shadow reaches about 3/8” in length, it is time to refocus. Just one setup of the ASSC and Sunsight as described above is more than enough cooking time a whole chicken, bread, cake, veggies, roasts - just about everything but the very long cooking foods such as dry beans. 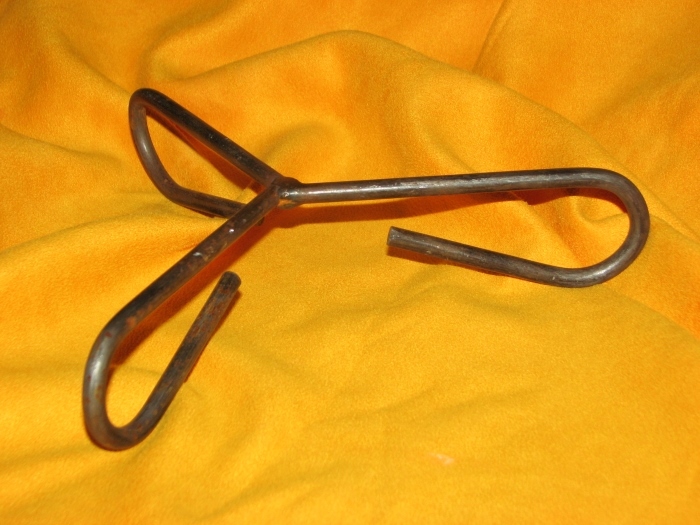 Included with the cooker is a 3 legged trivet. The trivet raises the cooking pot off the floor and allows light (and heat) to strike the bottom of the pan. This provides for more even heating and is especially useful when cooking breads. The cooking area of the All Season Solar Cooker is 12” by 12”. There is no upper limit on interior height. The cooking area remains the same when the ASSC is in its winter or summer position. There is no door that will limit the size of your cook pot. Oven roasting bags (turkey bags) can be used to cook with almost any size cook pans and they will give you about a months worth of cooking if you take care not to damage or dirty them. But, if you want a more durable and a bit more effective method of cooking in the ASSC then I would suggest you use a glass enclosure for your pots/pans. The cooking enclosure can be accomplished by joining, or resting two transparent glass bowls together to create a sealed airtight interior where your pot/pan can absorb the suns rays and become trapped heat energy that then transfers to your food.